We’re always developing and testing new recipes that fit the Dinner Daily model of nutritious, delicious, easy to make and just a few ingredients. Here’s one that is a sneak preview! 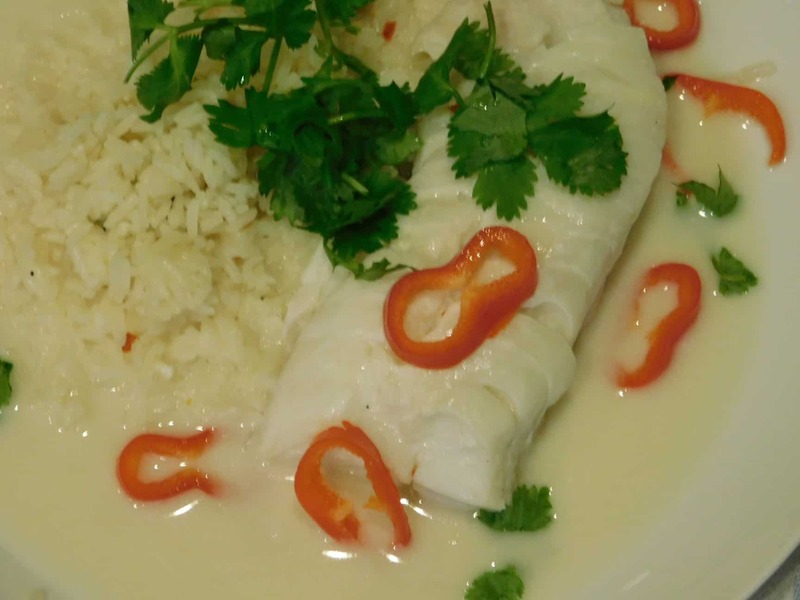 Its a new poached fish recipe using lime and coconut and it’s a winner. We haven’t released it to our menus yet (coming soon!) but when we tested it in our test kitchen, we just couldn’t help sharing it. Super simple to make and sooooo tasty! Cook rice and set aside. Place coconut milk, red pepper flakes, lime juice & fish sauce in large skillet over med heat. Bring to a low boil, reduce heat and simmer for about 5 mins. Add fish, cook for 3 to 4 mins each side or until cooked through. Place fish and rice on plate and divide the sauce amongst the plates. Be generous with the sauce-it is delicious! Sprinkle with chopped cilantro and red pepper, if using. This poached fish comes out flaky and tender and oh so flavorful. We think its a great one even for your family members who aren’t big fish eaters. For best results, buy your fish fresh that day or the day before. Don’t let the fish languish in your fridge. Also, be careful not to overcook. white fish like cod cooks very quickly, so be watching when you put it in the oven. Give it a try and tell us what you think in the comment section below! If you like this poached fish recipe, imagine receiving a weekly menu every week, with easy to prepare meals picked just for you based on your food preferences, and what’s on sale at your store! Eat better, save time and save money! Find out more about The Dinner Daily or give it a try – your first two weeks are free!